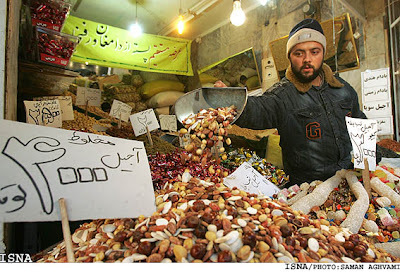 Tehran, Dec 21, IRNA – Iranians throughout the world will celebrate the longest night of the Iranian calendar year, Yalda, in a tradition welcoming the birthday of the Goddess of Love, Mitra. Yalda, the last night of autumn and the beginning of winter, is observed in every Iranian family here or abroad with ethnic roots to Iran. On Yalda night, which this year falls on December 21, members of the family stay together, narrate old stories told by ancestors, play traditional games and eat dried and fresh fruits symbolizing various things. Pomegranates, placed on top of a fruit basket, are reminders of the cycle of life — the rebirth and revival of generations. 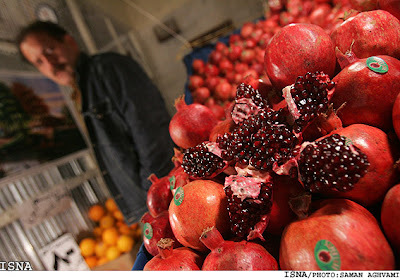 The purple outer covering of a pomegranate symbolizes “birth” or “dawn” and their bright red seeds the “glow of life.” Watermelons, apples, grapes, sweet melons and persimmon are other special fruits served on Yalda night and all are symbols of freshness, warmth, love, kindness and happiness. The Syranic word “yalda,” meaning “birth,” has its origins in ancient Persia and has come to symbolize a tradition observed since a thousand years ago in any Iranian family. Ancient Iranians believed that the dawning of each year is marked with the re-emergence or rebirth of the sun, an event which falls on the first day of the month of Dey in the Iranian calendar (December 21). On this day, the sun was salvaged from the claws of the devil, which is represented by darkness, and gradually spread its rays all over the world to symbolize the triumph of good over evil. Since Yalda night is the longest and darkest night of the year, it has come to symbolize many things in Persian poetry — separation from a loved one, loneliness and waiting. After the night is over a transformation takes place — the waiting is over, a new life begins and good triumphs over evil. 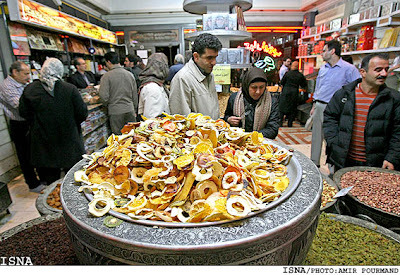 Reading poems of the Iranian poet, Hafez, is one of the most familiar activities on Yalda night. The dream was cartoon-like, images too flowery, colors too vivid, animation too vibrant…emotions it provoked too child-like. Eyes smiled open, body floated off the bed, window slid aside, sweet morning breeze found its way into my lungs. The breeze dragged me onto the beach. The fine sand grains massaged my whole existence. Too lost in my own entity to notice another figure floating beside me. Moments had to pass for the mental fog to settle before I could make out the words being directed at me. I wasn’t sure if it was a question or a statement, so my smile was the only reply I gave. A weird feeling took over then. A certain energy was present. I felt she was the answer…only I wasn’t sure what the question was. “Why do you ask? Do I look familiar? “No”…and I wanted to add…but you feel familiar…but I didn’t. She stood there staring into the horizon. Then there was silence…but not tortuous. That’s it, that was the only question that mattered. That was the only answer I wanted. Today I shed a couple of tears, silent tears, light tears, liberating tears. Sometimes the traffic light takes longer than usual to turn green, you mind wonders, again the same old question is posed, again the long sought answer is not found. You sigh, your head tilts slightly to the left; then all of a sudden your eyes become entrapped by what it sees. This pic was not taken on the same day. The side mirror reflects an image: A vast canvas of soothing blueness with strokes of whiteness brushed across the sky in message-like patterns. It talks to you. You listen. You feel the message. That feeling throws you into a whirlpool of answers. The honking pulls you out of the whirlpool, the light has turned green. Unwilling you are torn away from that moment, the dialog is lost, your soul was snatched back by reality. Your are lost, your are numb, you are dangling in between…in between what you don’t know? Where was your soul heading? What was it leaving behind? You don’t know. All you know is that it is ‘in-between’ and this half-way world is peaceful. How excited did I become when I found out that Dar AlـAthar AlـIslamiyah would be hosting a traditional Iranian concert?-> Jumped up so high doing the dance of joy that my head damaged the ceiling. And what a night it was. A rejuvenating night for my soul for it was my soul not body that danced to the melody of the music. Now I know why people close their eyes, smile and wave their head side to side when listening to music…I was doing that!!!!! The best part of the evening was the encore. Once their performance was over, the crowd drew them back on stage with their cheers. They played the Iranians version of a Kurdish song they had previously played earlier. Then when the clapping of the crowd died down, the vocalist sang: Ey Iran, ey marzeh por ghohar. This was when my mom’s soul was revived. She started to sing along with them and the Iranians in the audience (which incidentally weren’t too many) clapped all through the song. I must confess that their version of “Ey Iran” was the best I have ever seen or heard.